New Roof Cleaner EZ-Pouch packaging! Focus groups investigated consumer’s concerns about the handling of roof cleaning products. Worries about what to do with left over products. In response Cleaner TODAY has created the EZ-Pouch. Each EZ-pouch is premeasured to 1 pound, just add to water. EZ pouch does not need to be measured, or mixed with other soaps*, open the pouch, pour into water, discard empty pouch. Measuring Is confusing Each 1 pound EZ-Pouch is premeasured, Just add to Water! Shipping costs are too high on Liquids EZ-pouch is a concentracted powder, you don’t pay to ship water3! Leftover product is not as effective EZ-pouch extras are still sealed in the manufacturer package, ready to use! 2. Other products require common dish washing soap to be added. Which soap? How much? 4. 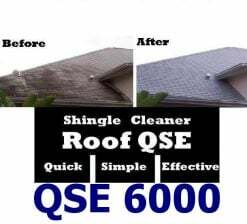 1 QSE EZ-pouch makes 4 gallons, 2 OX EZ-pouches make 4 gallons of roof cleaner both cover 750 sq ft.